The cords of Sheol were entangling me; I encountered the snares of death. In my distress I called upon the Lord; I cried to my God, and He heard my voice from His temple; my cry came into His ears. Then the earth reeled and quaked, the foundations of the heavens trembled and shook because He was angry. He rode on a cherub and flew; He was seen upon the wings of the wind. He made darkness His canopy around Him, gathering of waters, thick clouds of the skies. He sent out arrows and scattered them; lightning confused and troubled them. The channels of the sea were visible, the foundations of the world were uncovered at the rebuke of the Lord, at the blast of the breath of His nostrils. 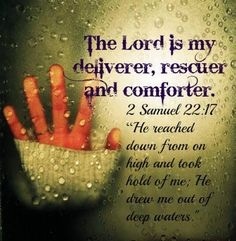 He sent from above, He took me; He drew me out of great waters. They came upon me in the day of my calamity, but the Lord was my stay. He brought me forth into a large place; He delivered me because He delighted in me. The Lord rewarded me according to my uprightness with Him; He compensated and benefited me according to the cleanness of my hands. For all His ordinances were before me; and from His statutes I did not turn aside. I was also blameless before Him and kept myself from guilt and iniquity. Therefore the Lord has recompensed me according to my righteousness, according to my cleanness in His [holy] sight. Toward the loving and loyal You will show Yourself loving and loyal, and with the upright and blameless You will show Yourself upright and blameless. To the pure You will show Yourself pure, and to the willful You will show Yourself willful. And the afflicted people You will deliver, but Your eyes are upon the haughty, whom You will bring down. For You, O Lord, are my Lamp; the Lord lightens my darkness. For by You I run through a troop; by my God I leap over a wall. As for God, His way is perfect; the word of the Lord is tried. He is a Shield to all those who trust and take refuge in Him. For who is God but the Lord? And who is a Rock except our God? 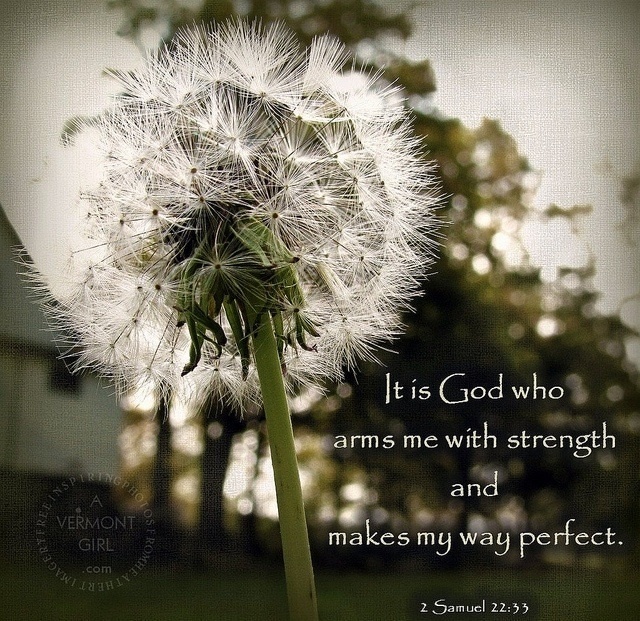 God is my strong Fortress; He guides the blameless in His way and sets him free. He makes my feet like the hinds’ [firm and able]; He sets me secure and confident upon the heights. You have also given me the shield of Your salvation; and Your condescension and gentleness have made me great. You have enlarged my steps under me, so that my feet have not slipped. I have pursued my enemies and destroyed them; and I did not turn back until they were consumed.I consumed them and thrust them through, so that they did not arise; they fell at my feet. You have made my enemies turn their backs to me, that I might cut off those who hate me. They looked, but there was none to save—even to the Lord, but He did not answer them. Then I beat them small as the dust of the earth; I crushed them as the mire of the street and scattered them abroad. You also have delivered me from strife with my people; You kept me as the head of the nations. People whom I had not known served me. Foreigners yielded feigned obedience to me; as soon as they heard of me, they became obedient to me. Foreigners faded away; they came limping and trembling from their strongholds. 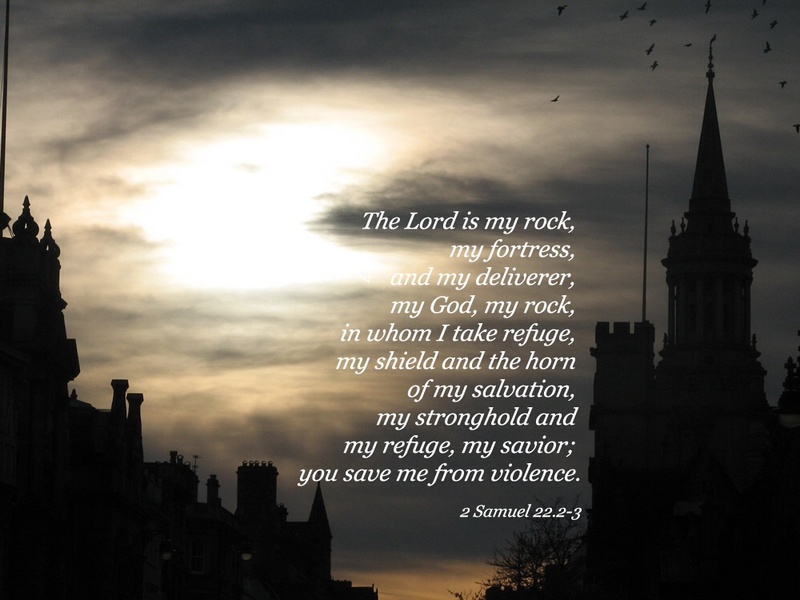 The Lord lives; blessed be my Rock, and exalted be God, the Rock of my salvation. Who brought me out from my enemies. You also lifted me up above those who rose up against me; You delivered me from the violent man. 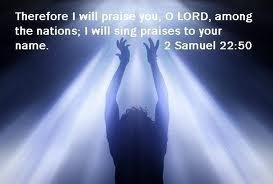 For this I will give thanks and extol You, O Lord, among the nations; I will sing praises to Your name. Posted in Domestic Violence and Abuse, Spirituality and tagged 2 Samuel 22, David, God, Lord, O Lord, Rock, salvation, Samuel 22 Amplified Bible, Sheol, The Word of the Lord. Bookmark the permalink. Amen Sister. I looked back one day at the scriptures that I held onto over all of those years and they were many of David’s cries for the Lord to rescue him, I repeatedly prayed those prayers and proclaimed those words over my life as you did. God has rescued both of us and I know that that was a key to the miraculous intervention in our lives. God is so good and amazing. I pray for many more to grasp hold onto the Power in God’s Words and reach for their destiny in Christ. Many blessings to you. Love you sister!! Yes and amen! Set the prisoners free Lord! PS I was all over the place with my comment for which I apologize however, I know you understand what I was trying to say! I totally understood everything you said sis. And I wish I knew then what I know now. Lol! Oh well, laugh or cry, it has been one heck of a ride. And I met Jesus on the way. What more could a girl ask for! I so wish I would have had your wisdom and encouragement 22+ years ago. But I didn’t and like you I made it! Blessings in abundance. It seems as though horrid memories of what was have been tucked away and your Blogs help me tremendously untucking them and moving forward. You are truly a blessing to me! Through the struggle there is hope. Everyone needs some wisdom and encouragement to get them through. This post signifies a better tomorrow, a time for change!